Spanish child murderer Enriqueta Marti was also a kidnapper and procuress of children who was born in 1868 in Sant Feliu de Llobregat. Enriqueta Marti moved to Barcelona when she was a young woman and held jobs as a maidservant/nanny but quickly turned to prostitution. She married a painter, Juan Pujalo in 1895 but their marriage did not last long because he said she had several affairs with other men and he did not like her character and her visiting repute places. Juan and Enriqueta broke up and got back together about six times but did not have any children. Enriqueta and Juan were separated for five years during her 1912 detention. Enriqueta would use children that are not hers to help her beg in the impoverished parts of town during the day at convents, houses of charity, and parishes. She would either murder the child/children or prostituted them. Enriqueta did not beg herself because she had the children doing that for her and the children were the main source of her income as she works as a procurer and prostitute. Enriqueta visited places where wealthy Barcelona people are at night so that she can work as a procurer of children. She and a young man were arrested in 1909 at her flat/home on Barcelona"s Minerva Street after being accused of running a brothel where young children were being offered for sexual acts. The young man was from a wealthy family. She was not tried for her crime because of her ties with her wealthy Barcelona"s contacts. Enriqueta began practicing being a witch-doctor while prostituting children and used the remains of the children (between infancy to 9-years-old) she murdered to make her remedies. Enriqueta used the children"s body fat, blood, hair, and bones to be made into a powder. She did not have a problem with authorities finding her victims or disposing of their bodies because most of it was being used. Enriqueta made a lot of money from wealthy people as she sold remedies (salves, filters, ointments, poultices, potions) for various diseases that did not have a cure at the time with tradition medicine. Enriqueta was arrested at a flat in El Raval. Several more evidence was found in her previous residence in Barcelona. Forensic experts discovered there were 12 children from the little evidence found. Police are not sure if Enriqueta was Spain"s deadliest serial killer because it is hard to say how many children she killed when there is not much evidence. Police and the city looked for about two weeks for Teresita with no clue until Enriqueta neighbor Claudia Elias told her mattress maker that Teresita is with Enriqueta. Claudia became suspicious of Enriqueta after she quickly closed her window when Claudia asked her if the little girl was hers. Claudia saw Teresita looking out of a basement window on February 17 at Mezzanine number 29, Ponent Street. The mattress-maker told the municipal agent, Jose Asens about Claudia Elias" suspicions and Jose told Ribot. Ribot and two officers went on February 27 to Enriqueta"s flat to look for Teresita but told Enriqueta that there was a complaint about chickens in the apartment. The policemen found two girls, Teresita Guitard Congost and Angelita in Enriqueta"s flat. Teresita mentioned that Enriqueta promised her candies and then covered her with a black rag and forcibly took her to her flat. Enriqueta cut Teresita"s hair and told her that her name is now Felicidad because she does not have parents anymore. She gave Teresita stale bread and potatoes to eat, demanded Teresita call her "stepmother" and would pinch her instead of beating her. Teresita said she was not allowed to go to the balconies, several rooms, and the windows. Teresita went on to telling police that she and Angelita explored the flat one day when Enriqueta was not home and found many girl"s clothes in a sack that was covered in blood and also a boning knife covered in blood. Angelita mentioned that there was a five-year-old boy named Pepito before Teresita arrived at the flat and that Enriqueta killed Pepito on the kitchen table, but Enriqueta does not know that Angelita saw her killing Pepito. Angelita does not remember her real surname which makes it harder to identify her, but she said that Enriqueta mentioned that her father name is Juan Pujalo. Enriqueta claims that Angelita is her and Juan"s daughter, but Juan testified that he has not been intimate with Enriqueta for several years and he did not have any children with her. She then claimed that she took Angelita from her sister-in-law when Angelita was a newborn, and her sister-in-law does not know because she told her sister-in-law that the baby was stillborn. 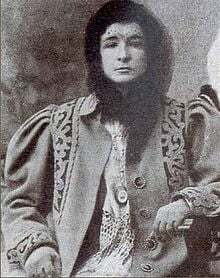 Enriqueta was arrested and served time in the Reina Amalia prison. Detectives went back to the flat and discovered the sack filled with bloody clothes and the knife with blood on it. The investigators also found another bag containing about thirty bones which give evidence that they were exposed to fire along with some dirty clothes in it, fifty pitchers/jars/wash bowls containing preserved human remains such as children"s hair, greasy lard, coagulated blood, powdered bones, and skeletons of hands. There was also her potion pots with potions, ointments, and salves. Detectives decided to explore two previous flats that Enriqueta had lived and revealed more evidence. They found human remains in the ceilings and false walls hiding a three-year-old child skull, and several bones that came from children ranging from age 3 to 8. Some remains were clothes that were still intact on the corpse revealed that she kidnapped kids from impoverished families that do not have enough money to look for their missing child/children. Enriqueta slashed her wrist with a wooden knife in an attempt to commit suicide while awaiting trial in the Reina Amalia jail. Enriqueta"s prison mates killed her fifteen months after her arrest by lynching her on the prison patio on May 12, 1913, so she was never tried for her murders/crimes. She was secretly buried in a common grave in Cementerio del Sudoeste which is located on the mountain of Montjuic in Barcelona. Enriqueta Marti serial killer is a female serial killer. The Vampire of Barcelona, The Vampire Of The Raval is a female serial killer.